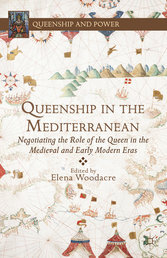 It’s my great pleasure to introduce you to Elena “Ellie” Woodacre, most recently the editor of Queenship in the Mediterranean: Negotiating the Role of the Queen in the Medieval and Early Modern Eras (Palgrave MacMillan 2013). Elena is Lecturer in Early Modern European History at the University of Winchester, UK. A specialist in medieval and Early Modern queenship, she completed her PhD at Bath Spa University. Her recent monograph, The Queens of Navarre 1274-1512; Succession, Politics and Partnership (2013), is based on her research on the queens regnant of Navarre, focusing particularly on issues of female succession, matrimonial diplomacy, and the power sharing dynamic between the queens and their kings consort. In addition to presenting her research at several international conferences in recent years, Elena is the lead organizer of the Kings and Queens conference series and the founder of the Royal Studies Network (see links on the sidebar). She also served as the French and Spanish editor for the Female Biography Project. Intrigued? Me, too. Violante’s many wills, the consorts of Moroccan sultans, dowers, a queen’s destroyed objects–I see more than a few plots arising from those pages. And I am so glad that Ellie had time for a Q&A. AWR: How did you come to compile the papers in Queenship in the Mediterranean? Ellie: Queenship in the Mediterranean is a legacy of the first of the Kings & Queens conferences which was held in 2012. There was a wonderful offering of papers on queenship-my co-organizer Sean McGlynn commented on the number which focused on women from the Mediterranean area. Even though there have been many excellent, geographically based collections on queenship including studies of English, French and Iberian queens, the Mediterranean had never been covered in a comparative volume. It is a fascinating area-incredibly diverse in terms of types of political entities, religious practice and cultures which makes it a fascinating case study for female agency. Even though the individual chapters in the volume span a very wide time period and different political contexts, taken together, they reveal many of the connecting threads of queenship. As one of the participants in the volume, Cinzia Recca, noted to me during the conference that even though her own specialty is 18th century Naples, when she was listening to papers on Byzantine Empresses or medieval Iberian queens, she felt that the key themes of queenship were constant throughout. AWR: You also founded the Royal Studies Network (www.royalstudiesnetwork.org). The website is becoming a treasure trove of information on books in the field, conferences, papers, bibliographies, links to other online resources, and this year will bring the premier issue of an online journal. What’s your vision for the organization? Who are your target members? Ellie: The Royal Studies Network also grew out of the Kings & Queens conference series. Sean and I were literally floored at the enthusiastic response we received to the call for papers and it made me realize just how many people were working in the field of royal studies. There is such a diverse range of scholars whose work touches on aspects of monarchy-one of the best things about coordinating the network is seeing the membership forms come in and reading about all of the exciting studies in progress in the field. Membership is very open; there are no fees or dues and we encourage anyone whose work is connected to monarchy to join-any time period, geographical context and any discipline (history, archaeology, literary studies, art history etc.) to join. Members come from literally all over the world and you don’t need to be affiliated to a university either, we are happy to accept independent scholars and students at various levels as well as academics. The idea with the network was to serve as a forum to exchange information and enable collaborative research. It’s tied to the conference series and the new journal and we have a very active facebook group and twitter feed to help share information on new books, conferences and other news that might be of interest to our members. The new Royal Studies Journal is on the way-we will be launching it this year, with a celebration at Kings & Queens 3 this summer. The journal will be online and open-access but fully peer reviewed and intends to provide a forum for research in the area and an academic home for the newly emerging field of royal studies. More information will be coming soon-we’ll keep you posted once the website is live and the call for submissions for the first issue is released! The conversation continues later this week with more nitty gritty questions such as what piqued Elena’s interest in queenship. See you then!